St. Jude Medical is a leading global medical device manufacturer and is dedicated to transforming the treatment of some of the world’s most expensive epidemic diseases. In this webinar, Russ Staiger, lead analyst of the Cyber Threat Action Center (CTAC) at St. Jude Medical, will explain how the company combines real-time threat intelligence from Recorded Future with its Splunk SIEM to more effectively fulfill CTAC’s mission to identify, protect against, respond to, and enhance resiliency against cyber security threats. 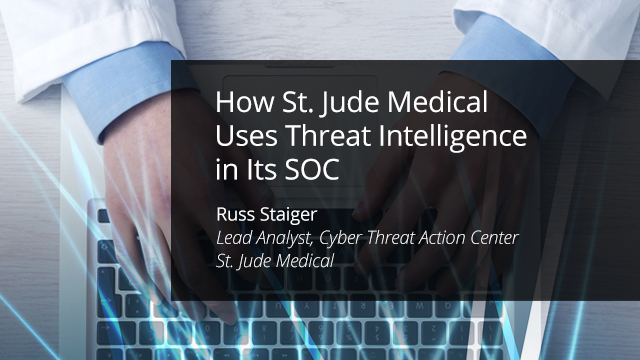 • How St. Jude Medical uses threat intelligence to monitor for emerging threats against the healthcare industry. • How St. Jude Medical makes informed verdicts on events in its SIEM using context gained from Recorded Future threat intelligence. • How Recorded Future helps St. Jude Medical detect more complex events and potential incidents that could have possibly been missed without enrichment. • How the team fosters secure collaboration between the SOC, other security teams, and the business. Russ Staiger is the Cyber Threat Action Center lead for information security teams concerned with investigation of APT (advanced persistent threats), malware remediation, and SIEM-based security strategies. Russ’s expertise also includes defensive systems data analysis, operational metrics (ITSM), in-line IDS-IPS implementation and action planning, security training and education, incident response, and team operations SLA enforcement.